Using the updated double-secret reverse reveal draft pick method and some triple-folded left over Christmas card envelopes, the draft order for the 2019 season of the 3FL has been chosen. Ten of the twelve teams in the league were present during the selection process. Possible rule changes are being taken into consideration and may be put to a vote during training camp. We will tentatively hold the live online draft at 9:00pm EDT on Thursday, August 29, 2019. Here are the top performers at each position for the 2018 season. Also, the playoff portion of our records page and individual statistics for each manager (on the sidebar) are up to date through the end of this year's postseason. Congratulations to Coach Thad on winning his second 3FL championship on Christmas Eve evening! It all came down to MNF, but the Lightning left no doubt about it as they outscored everyone else in the league. Stay tuned later in the week for final stats and the 2018 season wrap-up. 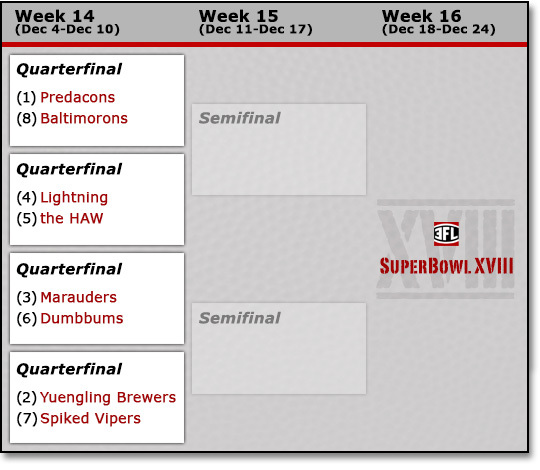 There wasn't a lot of late drama in the quarterfinals, but we're set up for an exciting SuperBowl week in all of our matchups! Remember that the Thursday games are finally finished but there are two Saturday games this week. The last game of our playoffs is this Monday night. Merry Christmas Eve of football! It's SuperBowl week in the 3FL! Well, this is disappointing. All the expectations for both of these teams at the end of the regular season have turned into a battle to not finish in eighth place. Will JuJu play? What happened Brees and Goff during the playoffs? It's going to be a great game, but does it really matter at this point? The Brew Crew returned to a respectable score one week too late. Now they have a chance to face the CAPS to win the consolation bracket and start next season on a two game winning streak. This should be a high scoring and competitive matchup. They even have the same number of Os and Qs. The luck ran out for both of our lowest seeds after turning the bracket upside down in the quarterfinals. That's OK for everyone else, as SpiVi is projected to put up the highest total this week. The 'Morons couldn't overcome their injuries to get a shot at a fifth title but the winner here will get a digital bronze trophy. So there's that. Here we go! It's not the final that Vegas predicted, but it's going to be a good one. These two teams are evenly matched and they have players in every time slot of SuperBowl weekend. Coach Thad will try to win his second championship while Coach Coaldog is aiming to etch his name on the trophy for the third time. Yahoo! is projecting this to be the lowest scoring game of the week, so starting lineup decisions are going be important. Can Big Ben lead the 'Bums to a win (and the Steelers to a playoff berth)? Will Julio Jones be healthy enough to play for the Bolts? It will all come down to a 3rd WR and a TE you've never heard of on MNF while Santa begins his deliveries. The curse strikes again!! The Preds were beaten by the #8 seed 'Morons and our top regular season team now has only a single title in 18 seasons. And the 2nd and 3rd seed are also in the consolation bracket after the quarterfinals. Yikes. All individual team pages (see links on the sidebar) and the 3FL Records have been updated and show statistics through the end of the 2018 regular season. This year's additions to the records page are in bold - and there are a lot of them! Through 1,422 regular season games we have scored a combined 183,766 points. Don't forget about the two Saturday games this week (in addition to Thursday night). Make sure your lineup is set. It was no surprise that the defending champs knocked off the #1 seed to make it to the second round of the playoffs. 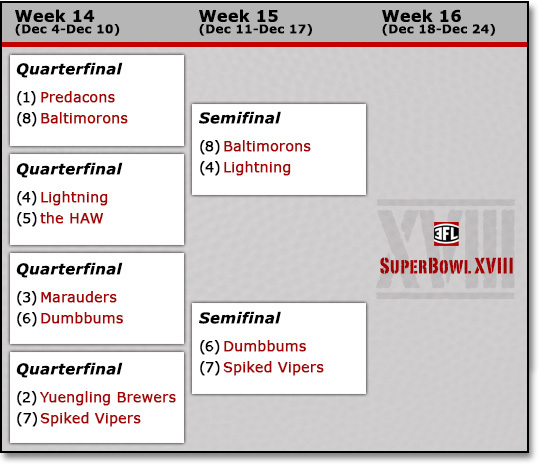 But it is a bit of a surprise that the Bolts are now the highest seeded team that's still in the championship bracket. Coach Thad will be the underdog here, too, and he'll have to make all of the right decisions to beat the favorable matchups of the 'Morons this week. It would be a shame to be just a TE away from a SuperBowl birth. Our two top scoring teams from last week meet each other for a chance at the championship. They've been an even matchup all year, earning the same record and having only 11 points separate them after 14 weeks. The story here is that both of their starting QBs are questionable and SpiVi's Wentz might be out for the year. Will they spend their one add/drop trying to pick from the waiver wire for a replacement? Or will McCaffrey and Kelce help them advance by exceeding their already high projections? All of the curses were just too much for the Preds to break. Despite their 10 win season and tying (with the HAW) for the scoring lead this season, the result ended up the same as the past 17 seasons. Meanwhile the CAPS had a down week in the quarterfinals, scoring more than 35 points less than their (league high) point estimate. All that said, this will be a good matchup that extends late into the prime time games. This wasn't supposed to happen. These two were supposed to be battling for a shot at the SuperBowl. But instead they meet here to try for 5th place at best. The Brew Crew had a strong year, but they waited until the playoffs to score their lowest total since...well since the week before. But the Marauders were in good shape even going into MNF last week. It took a silly performance by the Bears D for them to end up here. It might be our best matchup of the week (especially if both star RBs actually play), but the thrill is gone. The last four playoff spots were taken by teams that won their matchups in order to get in. 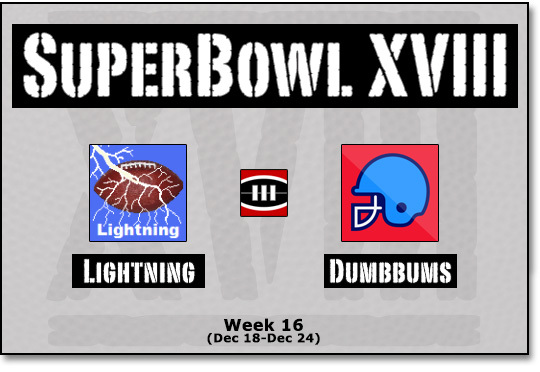 It's already shaping up to be an exciting run to SuperBowl XVIII! Remember that ROSTERS WILL LOCK AT 1pm THIS SUNDAY, December 9th. Under our playoff rules you will be allowed to make 1 add/drop per week once the postseason starts, but only teams still in the winners bracket will be eligible to make a move (with waivers set in reverse order of seeding). The Preds won ten games, tied as our top scoring team and earned our top spot, so now they have to deal with the curse of the #1 seed too. We all know what's going to happen to them this postseason. It's just a matter of when. Their loss might come as soon as this week, as the defending champion 'Morons are our hottest team despite their seeding. They've won their last three and have the highest projected point total of the week. It all came down to last week's game for SpiVi and they left no doubt, outscoring the rest of the league and punching the final ticket to the postseason. Now they get to play the team that had the lowest score last week. The Brew Crew saw a resurgence this season but all those Qs from our regular season finale remain. Who is going to actually make it onto the field? The 'Bums won't have their top RB for the playoffs so they'll have to come up with another solution. Replacing 200+ points won't be easy though. Still, this one looks to be our best game of the quarterfinals. These teams are evenly matched and Sunday Night Football will give us an exciting ending. Just one thing - I know it's only Thursday, but are these two serious about their Defensive starters? Our battle in the middle of the standings is going to stretch from tonight all the way through MNF. The Bolts have won their last three in a row but this one is going to be tougher, with the matchups heavily favoring the CAPS. Coach Thad will need a good showing tonight and he'll need to make all the right lineup decisions because prime time belongs to the HAW.